1985. When the hardest thing a hard group of guys could do to look hard was raid their mom’s cosmetic drawer. 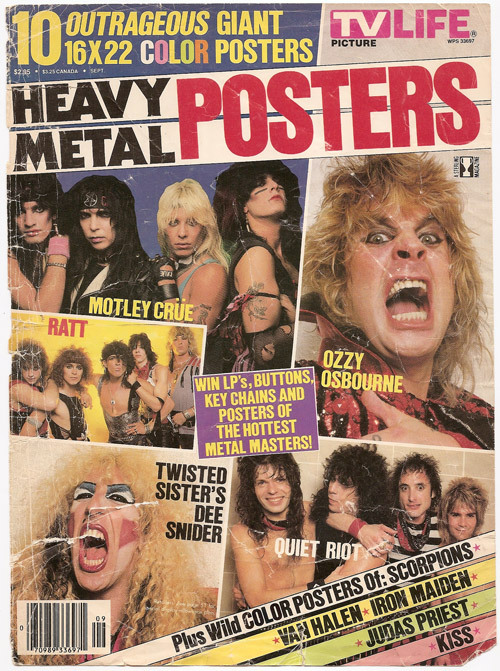 Add to that sixty odd pages and ten giant, color fold outs of bare chested guys in torn up clothes, pressing their sweaty bodies against one another and you have an issue of Heavy Metal Posters Magazine. Judging by the date of this issue, it was back in September of 1985 during a trip to the local grocery store that I went momentarily insane, grabbed this monument to metal of the shelf, and bought it. Turns out it actually wasn’t a bad deal. 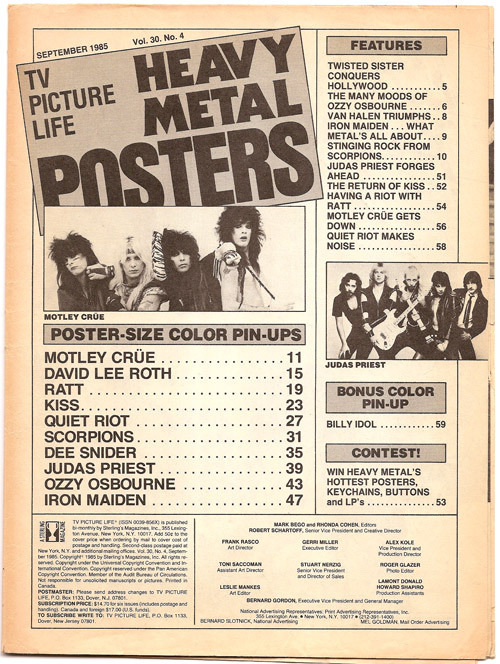 Even in 80s bucks, three dollars for ten posters wasn’t bad, despite the one catch that they were actually five double sided posters, so you were forced to choose which metal god you like better if you ever planned to hang them up, which I didn’t. In addition to all that, there was also a whole magazine to read which included interviews and the like with all the big mainstream metal icons of the day. From the pictures you might imagine that I perused the pages of this magazine several times, totally enthralled with tales told from the mouths of my favorite musical icons, wonder what it might be like to even go to one of their show, let alone meet them in person, or perhaps hang out with them on the tour bus, or behind the school (this was the 80s, behind the school was still a viable hangout). You would be wrong. In fact, it took me several years to even look through the “words” part of this periodical and realize the goldmine of content I had been sitting on. Similarly, the posters were never hung (although I did take them out and look at them a lot). I still have all the included posters, and they are in much better condition than the magazine itself. This was apparently a very popular publication in its day, this being Volume 30, No. 4, but I have never seen any other issue in my life.